A sauce made from soya, green chillies and garlic whose gutsy spice packs a real punch. With such well-loved flavours, this sauce mix can be used to make any one of your favourite Chinese Chilli recipes. What's in our Chinese Chilli? 1. Stir-fry 2 cups of chopped vegetables like spring onions, capsicum/ green and red peppers, along with 1-2 green chillies and 200gms. of paneer. 2. 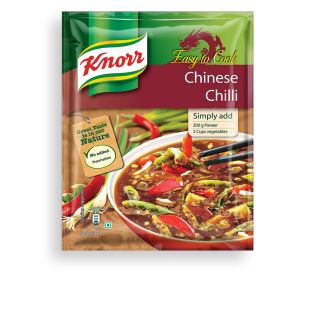 In a separate bowl, mix the contents of Knorr® Easy to Cook Chinese Chilli in 450 ml of water. Add to the vegetable and paneer mix and cook until the gravy has thickened. 3. Add 200g of fried paneer to the sauce and cook for 1 minute. Garnish and serve hot!